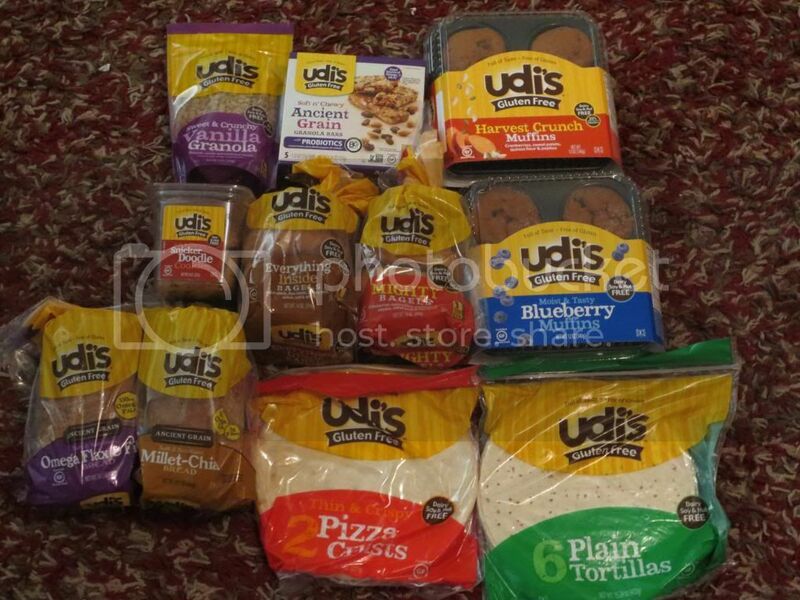 Special Delivery of Udi’s Gluten-Free Goodies – including brand new products! I spent all of my childhood growing up in New York. One thing that New Yorkers know is their bagels. Bagels are famous, especially in New York City, and can be found pretty much on every corner and in every bakery. Bagels, when done right, care the most amazing carbohydrate-filled breakfast out there. Especially when toasted, warm, and given a light schmear of cream cheese. Two years ago, I was in search of the most perfect gluten-free bagel. I tried so many brands, before finally spending a few extra dollars and purchasing the Gluten-Free Plain variety from Udi’s Gluten-Free. I swore I would never find a more perfect bagel than what Udi’s offered then. And, since that time, they have expanded their bagel selection from just the Plain, to offering Whole Grain and Cinnamon Raisin, and expanding it even more this past year with the addition of the Everything Inside Bagel and the Mighty Bagel. I was thrilled to receive both the Everything Inside and Mighty Bagels in a nice box that Udi’s Gluten-Free sent to me. While I had thoroughly enjoyed their bagels, I hadn’t made it a habit to purchase them. The reason mostly being that I am on a tight budget and while the craving for a good gluten-free bagel (they don’t get better than Udi’s) hit every now and again, I had too much stuff at home to really justify another purchase. Especially when it comes to breakfast food. Because I am a breakfast girl. Anyway, the box was a true treat as it contained some of their classic items they are best known for, as well as a smattering of their newest products out on the market. It struck a nice balance. And the box definitely made me smile. Well, the craving for bagels could now be satisfied. And, finally, at long last…today I could truly cave to that craving. After a 6 mile training run early, early, early this morning, I returned home to hop in the shower and then start getting everything together for breakfast. I had no plans and no idea what to make. I just knew I was running behind more than usual, so something easy would be best. I opened up the freezer and there they were…shining at me like the beacon of gluten-free goodness that they are…Udi’s Gluten-Free Everything Inside and Mighty Bagels. Eenie meenie miney mo…the Mighty Bagels won the draw this morning. 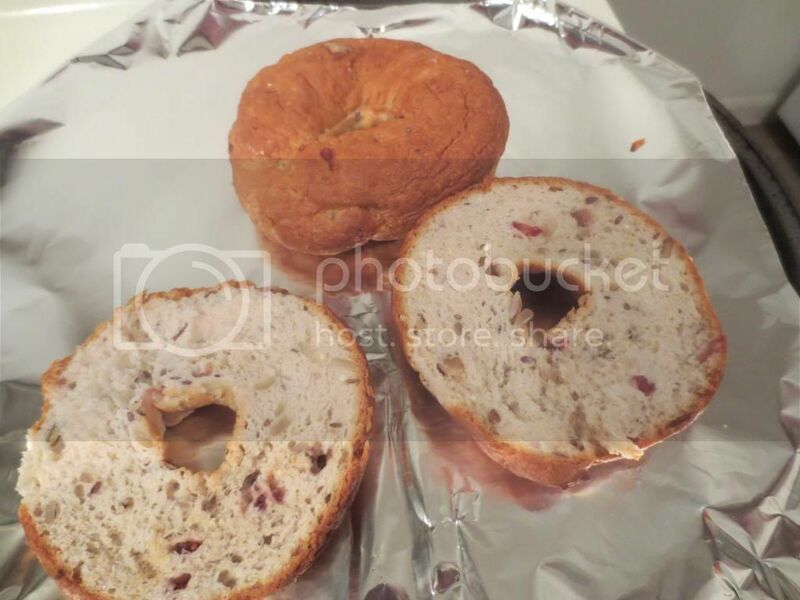 I went ahead and put the bagels into a plastic bag to thaw out while I heated up my oven to toast them (when I was diagnosed as a Celiac, I had to get rid of the toaster as my roomie loves her wheat bread and we had definitely used the hell out of that toaster when I was eating bread too). My roomie was going to experience her first gluten-free bagel. I had no idea what a Mighty Bagel included, but I could see what I thought were chopped nuts hovering on the surface…so now I had to give the package a good perusal. 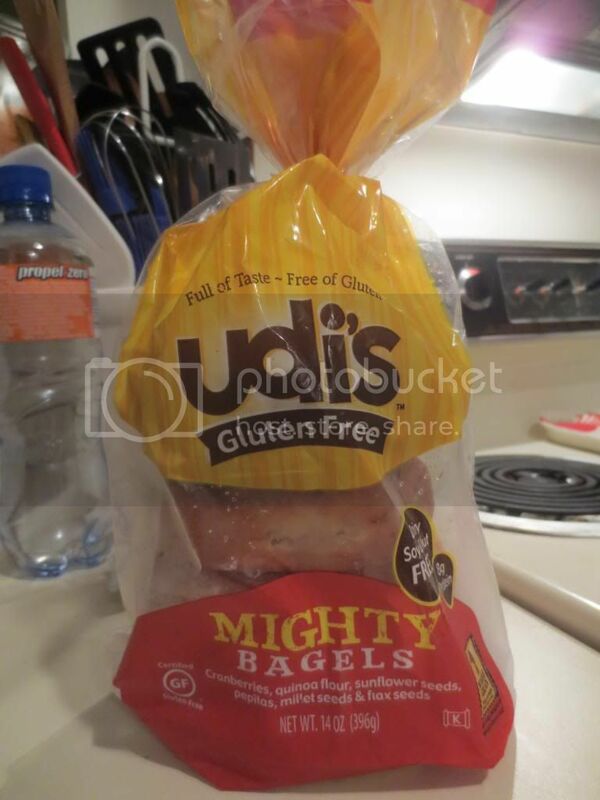 Udi’s Gluten-Free Mighty Bagels include dried cranberries, quinoa flour, sunflower seed, pepitas, millet seeds, and flax seeds. I hadn’t realized that. I just thought they were called “Mighty Bagels” because they were bigger than the original. This is what happens when you don’t read the packaging. No nuts, but plenty of amazing goodness packed into a bagel, that’s for certain. I was really excited about these, because the ingredients reminded me a lot of the Harvest Crunch Muffins that I had back when I first received the Udi’s Box of Awesome. The moment of truth came about 5 minutes after these were popped into the oven to toast. I put a light schmear of Tofutti Better Than Cream Cheese over the halves and served one bagel to my roommate and did the other one up for me. Given that Cathy is not a bagel person…she devoured this. In fact, I was still putting the vegan cream cheese on my bagel as she was nomming away, and I asked…”How is it?” I was awaiting…”It’s okeydokey.” Which usually means, “I’m not a fan, but I’m being nice.” But…she said, “It’s really tasty!” SCORE! My turn. I settled in for breakfast with my bagel, my fresh watermelon slices I cut up earlier that morning, and a cup of coffee. Now fully nestled in my breakfast spot, I took a bite…and it is definitely gluten-free bagel nirvana. Mighty tasty. Just amazing and awesome and delicious. They toasted up to perfection. And the generous scattering of the different seeds and the cranberries is evident…and totally delicious. It definitely added a nice hint of flavor to the bagel. Plain is all fine and good, but this definitely turned up the volume by mighty proportions. And on the nutrition front…these do okay. They are a bit high in calories, but what bagel isn’t. I guess that’s why I simply paired it with a bowl of watermelon. Anyway, one serving is one Mighty Bagel. This bagel will provide you with 300 calories and 11 grams of fat. Welcome to the gluten-free world. (*SAD FACE*). You get served 3 grams of fiber and an amazing 8 grams of protein. Loving those berries and seeds. These bagels are cholesterol free, low in sodium (370 mg) and contain 9 grams of sugar. For a bagel…not bad. For a gluten-free bagel…definitely not bad. Once again, Udi’s proves how they remain on top of the gluten-free products lists time and time again. Taste, texture, flavor, even the size of the bagels all compare to the regular (gluten-filled) bagels I ate growing up and into my early adulthood…before gluten and I became mortal enemies. I am thankful to have a company that I can turn to and know they keep their standards high when it comes to their products. You can tell, because more often than not…they hit it out of the park. They certainly won me over with the Gluten-Free Mighty Bagels. Welcome to my freezer…you’ll be there often. This entry was posted in Bagels, Bread, Breakfast, Food, Frozen, Gluten-Free, Products, Review, Vegetarian by The Celiathlete. Bookmark the permalink.